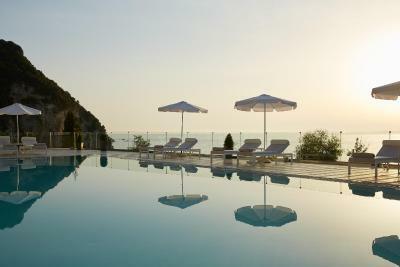 Lock in a great price for Mayor La Grotta Verde Grand Resort – rated 8.7 by recent guests! Beautiful facility. If you stay at the main buildings then you'll be fine. The pool and beach were great. All inclusive was good too but I think they would be better off if they lower the price a bit and include breakfast and either lunch or breakfast. Especially because the town has great taverns. Aside from one incident service was great. Friendly staff especially the golf carts guys and the trainees at the front desk. Very clean and comfortable staff very friendley n excellent service. This place is not a luxury property. It is a factory-style all-inclusive. Amazing location with an incredible beach. Amazing service provided by exceptional staff. 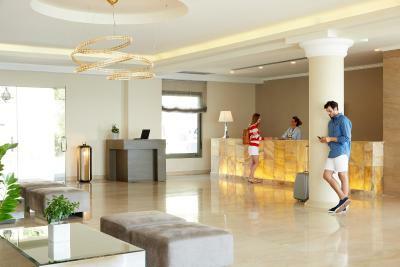 Amazing facilities with everything you need and want. Excellent variety of food options and great quality of food. Overall, ultimate relaxation time and fantastic anniversary celebration. This is an excellent value for money option that will have you wanting to stay more and wanting to desperately come back. 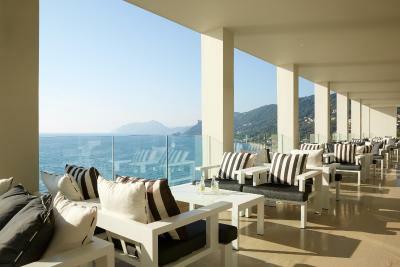 The location is stunning, the resort is beautifully clean with large rooms and amazing views. 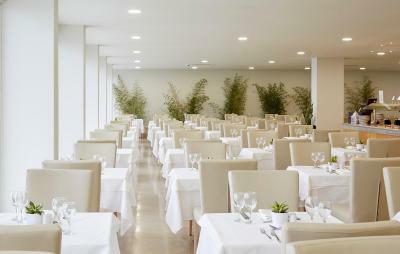 The waitering staff were very friendly, and luckily the food in the one open restaurant was excellent. Lovely pools and great beach bar and service. 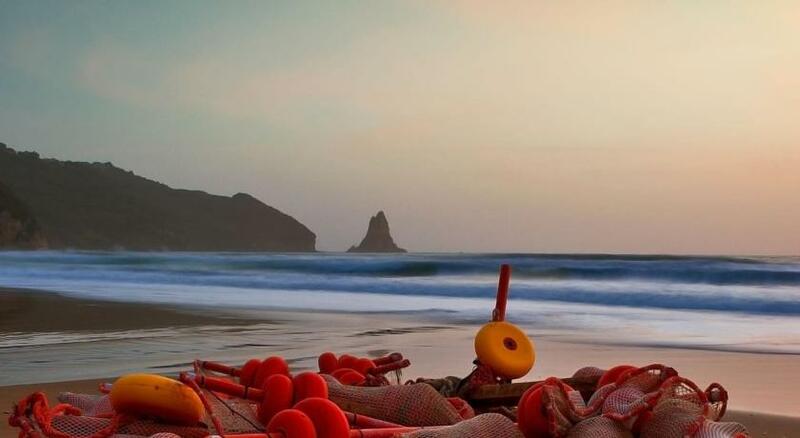 Good location, nice beach. Tasty food in main restaurant. Helpful staff. 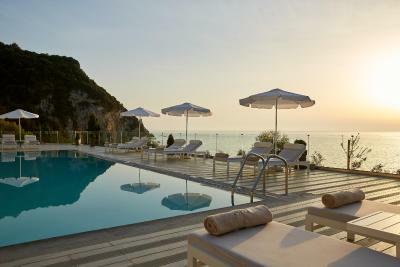 Amazing location, incredible sunsets, plenty of sun beds in multiple locations around pools and on the beach. The all inclusive drinks were reasonably good quality, our room was clean and as well as the sea view we paid for we were upgraded to a room with a jacuzzi plunge pool and sun loungers. Staff were helpful and friendly, plenty of choices at mealtimes. Good coffee / tea facilities in room and free bottled water daily. Air con worked well. Beds were very firm but that suited us. #1 Fantastic view across the Sea - Probably the best of any hotel that we've stayed in. #2 Mostly friendly staff - not all of them, but in the main, they were good. 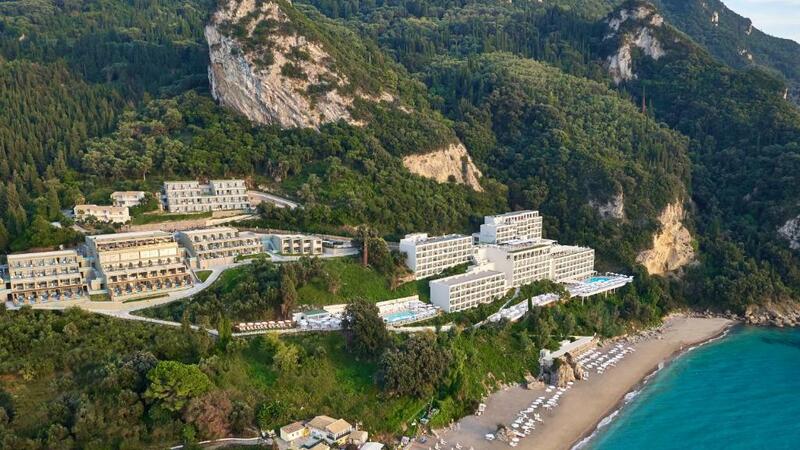 Mayor La Grotta Verde Grand Resort This rating is a reflection of how the property compares to the industry standard when it comes to price, facilities and services available. It's based on a self-evaluation by the property. Use this rating to help choose your stay! 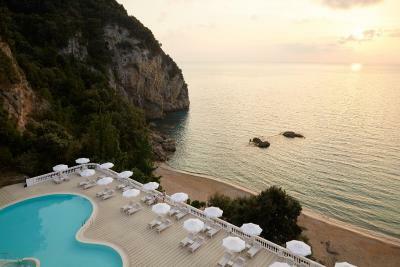 This 5-star, adults-only hotel stands among pine tree forests, right on Agios Gordios Beach in Corfu. Mayor La Grotta Verde Grand Resort offers 5 restaurants, 6 bars and 2 large outdoor swimming pools, as well as an indoor, heated pool. 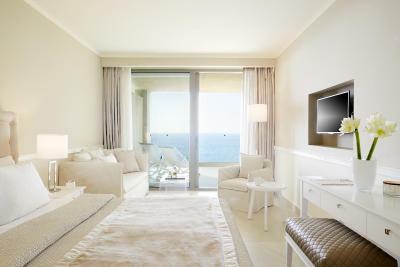 All units open to a balcony overlooking the Ionian Sea or the gardens. 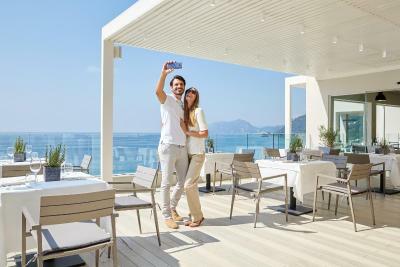 All air-conditioned rooms at the Mayor La Grotta Verde Grand Resort are elegantly furnished with light colors and include an LCD TV with DVD player and free WiFi access. Each has a mini fridge and a safety deposit box. Buffet breakfast is daily served at Androniki Restaurant. Guests are also able to participate at the Dine Around Project and try various snacks, dishes and drinks all-day long. 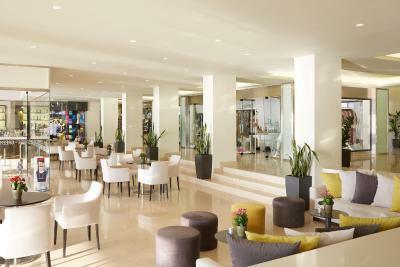 Bars are available at the lobby, the roof terrace, the beach and the pool. The spa features many facilities from free weights to hot stone massages. Relaxation from every-day anxiety, deep skin therapy and well-being sessions are just a few options for your personalized program. Massage therapies, as well access to the hammam and sauna, are provided upon charge. 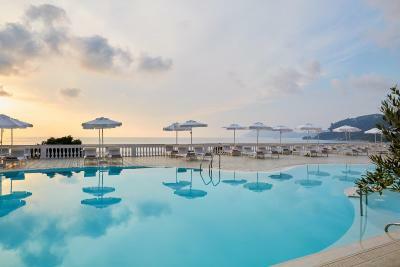 Achilleion Palace is 6.2 mi away and Corfu Town is at 12 mi. Free private parking is available on site. 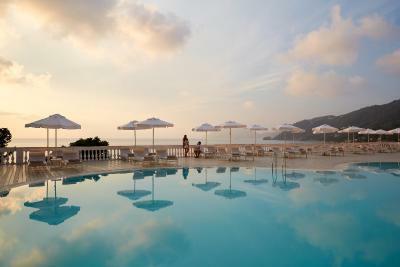 When would you like to stay at Mayor La Grotta Verde Grand Resort? 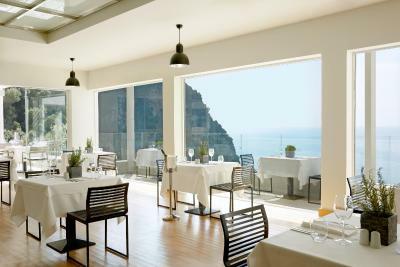 Offering panoramic sea views from its floor-to-ceiling windows and furnished balcony, this room includes air conditioning, a satellite, flat-screen TV and a bathroom with a shower. 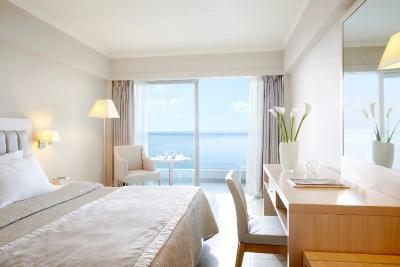 Offering Ionian Sea views, this elegantly decorated and air-conditioned room features a mini fridge and a flat-screen, satellite TV. Free WiFi is provided. 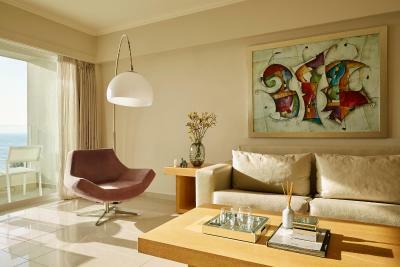 Offering a seating area and a separate bedroom, this air-conditioned junior suite features a balcony with garden view. 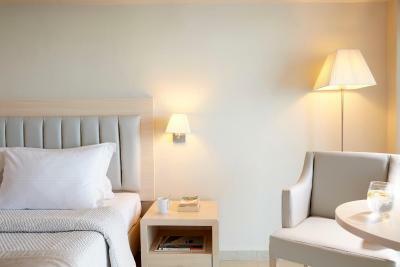 A flat-screen, satellite TV and free WiFi are provided. 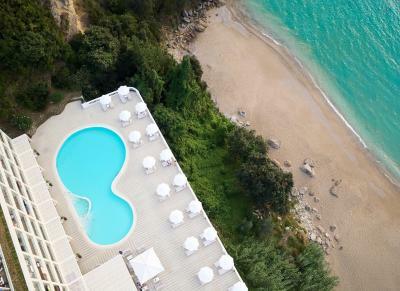 Offering Ionian Sea views and a seating area, this air-conditioned suite opens to a balcony and features a flat-screen, satellite TV. Free WiFi is provided. 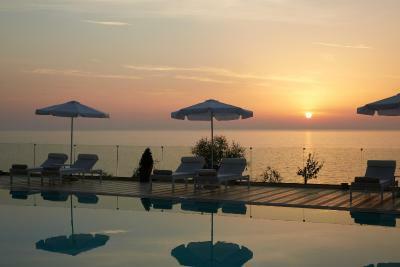 House Rules Mayor La Grotta Verde Grand Resort takes special requests – add in the next step! The Mayor La Grotta Verde Grand Resort operates on an all-inclusive basis. Please note that the a la carte dinner is not included in the all-inclusive scheme. Meals and beverages are not offered on departure day. Dinner is served until 21:00. Please note that extra beds are upon request and will be paid locally. There was supposed to be 3 restaurants, but there was only. They put two single beds together which was very annoying for me and my partner, the beds kept parting everytime we got close. Plus there was no insects net in the room, we were bitten all through the night. We did address this issue with them and we are still waiting for a reply. Little bit of climbing up and down to the beach and back, bat it’s good if you have all inclusive meal plan. Spa is expensive. Small car park. Steep climb up from the beach. Buggies to help the less able around the resort. #1 Poor All inclusive treatment - Food not presented very well, and very basic. Asked for a slice of lime with a drink and got told that it was reserved for paying customers only. There was just an all round, obvious disdain of All Inclusive guests when compared to Half Board guests. Drinks were appalling, the worst of anywhere I've stayed. If they could charge you extra, they did! #2 Snacks - what snacks! Breakfast 07am till 9:30am, Lunch 12:30pm until 3:30pm and Dinner 6:30pm until 9:30pm. Apart from a small range of snacks (cakes mostly) from 4pm until 6pm, no other food was available. #2 One or two examples of really poor customer service - As an example, we liked to go to market area bar in the afternoon, for coffee etc, normally open from 10am. On October the 1st, they just shut the area down until early evening, meaning a trek to another area. We didn't know that the hotel restricted services from October the 1st and when I confronted a member of staff he was very rude and basically screamed "look, the sign says we open at 5pm now", that's all I could get from him. I had to go to main reception to find out what was wrong. All in all, this was our honeymoon and I'm very dissatisfied with the hotel and it's services. The hotel cost me ~£3000 for 2 weeks and we met some friends there who had booked a week in the hotel as part of a package deal with TUI for £250 - need I say more! 5 star views but really a 3 star hotel in my opinion. The view was beaytiful. The crew was usualy friendly, especialy the restaurant employers. The variaty of drinks in the bar was not bad. Room was basic and bed wasn’t comfy, room was up a massive slope which wasn’t easy to walk up and down from. Lots of wasps around probably the time of year but we even got pestered on the beach! Hotel did have traps around and smoke repellent to discourage them. Room nice with lovely view. Staff very friendly and helpful. Plenty of sunbeds available Accommodation spread over large area amongst trees etc so it never seemed crowded. Food always fresh and plenty of choice. Breakfast is not varied. All inclusive Cocktails are average. Bees near the pool. 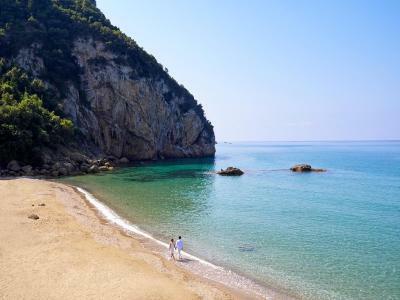 It’s far from Corfu town, but worth the travel, and perfect for people who just want to relax in the beach/pool. Full inclusive slightly complicated as u need to book some restaurants to get a table (queue on reservations) + not very easy to understand for the first time. 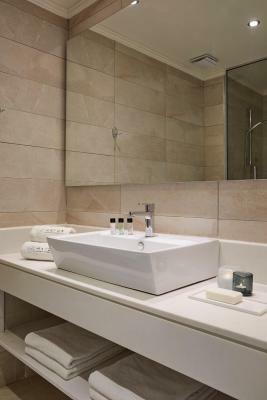 Room is good but not a 5 star level one (no amenities in bathroom for example... bring you cotton pads with you!!) Food is Average in all restaurants. Nothing very much fancy but convenient I would say. Food buffet for breakfast and dinner was good but maybe not as good as some of the other food we experienced on the island. Ate at the Italian restaurant on night which was a little on the bland side. Didn't get to try the lunch but there is definitely plenty of food provided at this place. We booked this hotel after having problems with our other accommodation and in comparison is was amazing! The resort is massive with two swimming pools, spa, few minutes walk from a lovely beach with sun loungers and beach towels provided by hotel. Free drinks and food was all inclusive in price. Beach bar as well as bar by the swimming pool. Clean room and very professional staff. After a day or so of relaxing here its nice to leave and go to other parts of the island. Personally I wouldn't want to stay at the hotel for too long without leaving at all but depends what type of holiday you want.